After torrential rain all day yesterday, we warmly welcomed the return of the sunshine today and went to play on the beach. 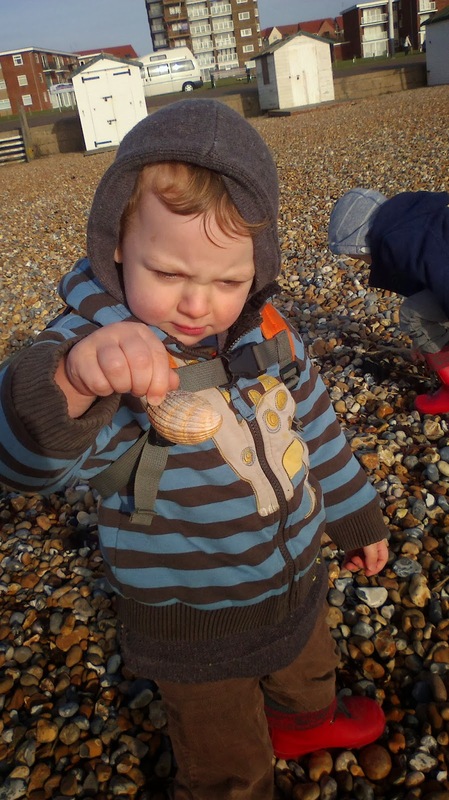 Ollie had an idea about making shell pictures, and as luck would have it one result of all the storms has been the greatest concentration of sea shells I've ever seen on a local beach. We spent an hour foraging for whelk, oyster, slipper limpet and cockle shells, and even found a really nice big scallop shell. Then it was off home for some soup to warm us up, and an afternoon playing with our treasures. 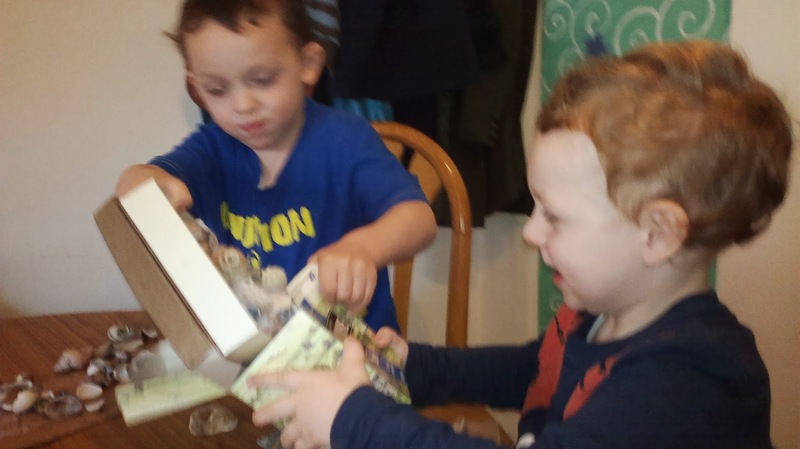 I fished out the largest shells, then gave the boys the rest of the shells on a tray, a piece of corrugated card each (old packaging from something) a pot of PVA glue and an old paintbrush each and let them crack on with whatever design they fancied. 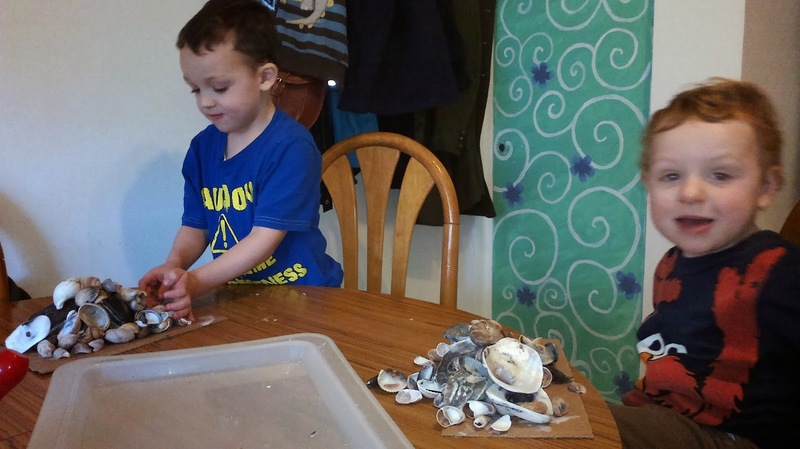 Ollie went for the biggest remaining shells first and was a bit disappointed when they all slid off when he held up his masterpiece to show me, but was fine when we treated it as a scientific experiment to see if lighter, smaller shells fell off as quickly as the large ones did. He never did master the patience to let the glue dry before picking up the cardboard. Toby seemed to go about it with more patience, carefully selecting just the right shell to add to his growing picture. 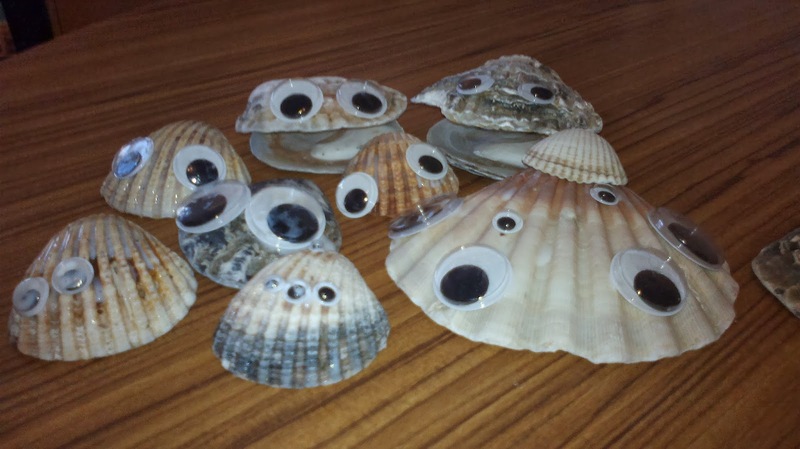 Next, in order to give the pictures some chance to dry, I gave the boys googly eyes to glue on to the largest shells to make monsters. I really like Ollie's cockle with numerous tiny eyes, and Toby's scallop complete with a jaunty cockle shell hat. Setting these aside to dry, the boys returned to their collages, this time piling shells high to make castles. Finally I brought out a couple of old cardboard boxes for them to fill, since filling and emptying containers has always proved to be of endless entertainment to them in the past. good opportunity to encourage investigating how everyday objects look, feel and smell and developing language skills to describe these observations. For Toby this is just giving him lots of praise and modelling the word 'shell' back to him when he tries to say it, and using words and Makaton signs to describe the colours. For Ollie it is using more complex language such as when he says 'the shells feel bumpy' saying 'yes they do, you can feel the ridges on the cockle shells'. 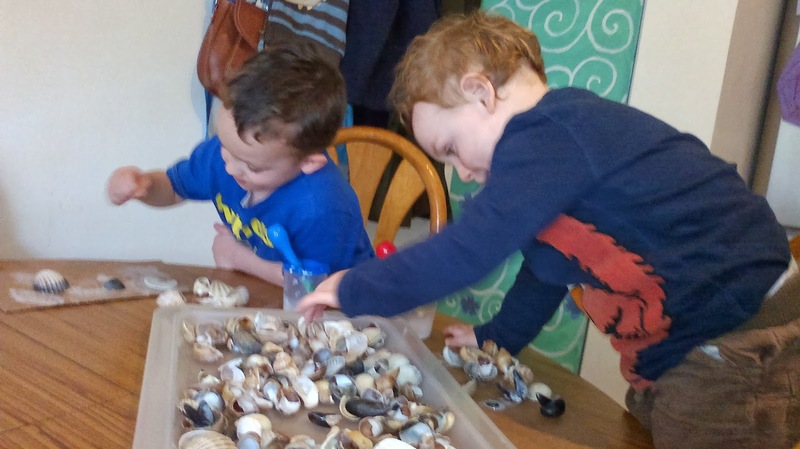 The boys would have kept playing with the shells for much longer than an hour, but at the end we were getting to the stage where Toby discovered what a wonderful loud crash they made when he tipped them out and they were starting to break into sharp pieces. I felt bad stopping him when he was laughing so delightedly, but since we had a new (rehomed) hamster trying to take a nap it was important to keep the noise levels down for once. The biggest challenge for parents setting up these kinds of activities with small children can be simply allowing the children to lead the activity where they want it to go. If you have an idea in your head that they will produce some amazing beach materials mandala you've seen in a book, you are setting everyone up for a stressful time as you try to control too much. Sometimes it is nice to have an outcome in mind, but holding on to this can too often result in disappointment, so that instead of seeing the brilliant, age-appropriate exploration they have conducted all you see is a mess of broken shells. That's probably a good metaphor for our parenting journey as a whole.